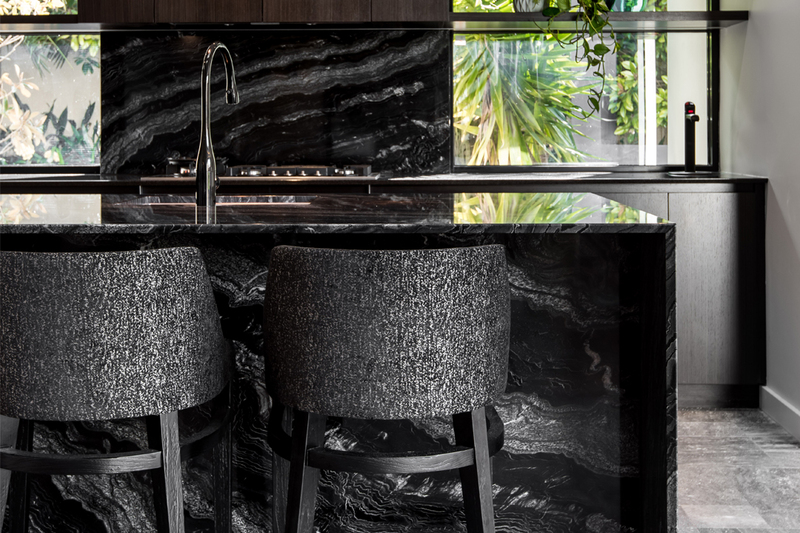 This minimalist kitchen features a complementary range of contemporary design elements and materials, including stunning granite, which was installed by Bravvo Pty Ltd. 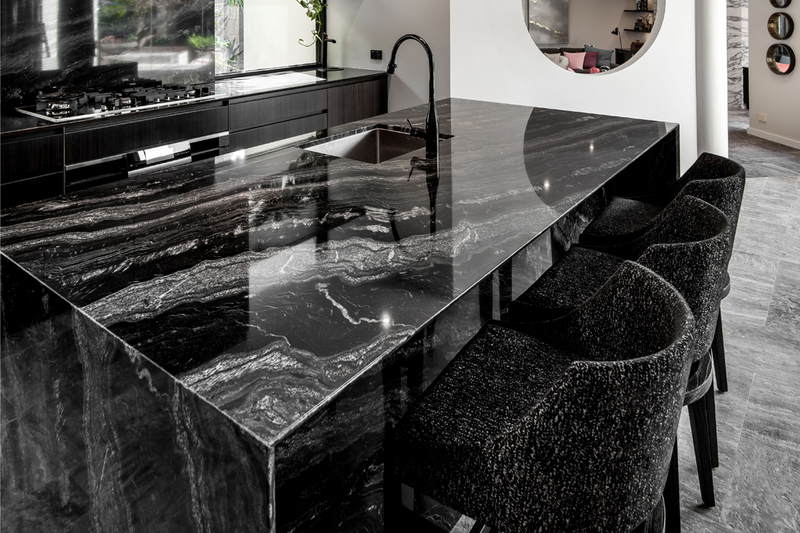 The eye-catching island bench and matching splashback feature polished granite in ‘Agata’, while the back bench features polished granite in ‘Absolute Black’. Stylish pendant lights and recessed downlights were installed to illuminate the work zones and enhance the visual appeal of the space. Designed by Studio Atelier, the kitchen includes ample bench space to make cooking and entertaining a breeze. The featured bathroom is characterised by clean and crisp lines that create a sense of opulence. 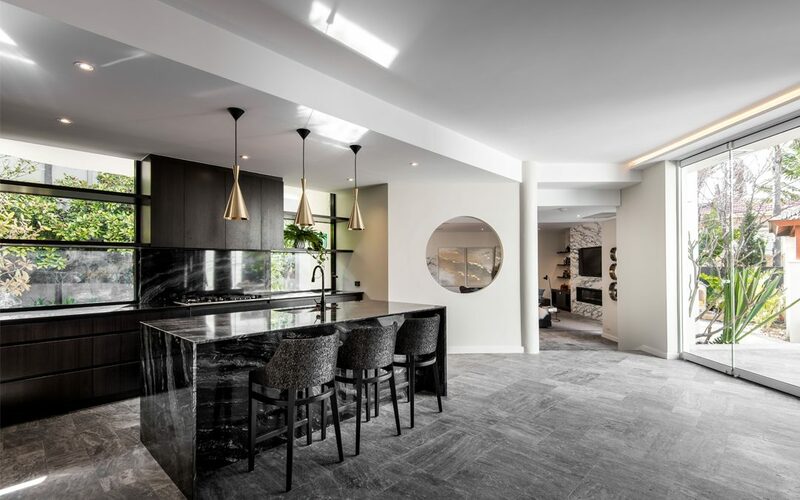 Large-format porcelain panels from Bravvo Pty Ltd’s Bella Marmi series were selected for the walls, which mimic the luxurious look of statuario marble. The bathroom floor and shower base feature panels from the Bella Cementi series in ‘Iron’. With minimal grout and joins, the 3000mm x 1500mm panels are easy to clean. Bravvo Pty Ltd supplies and installs a high-quality range of natural and composite stone varieties – including its own highly-praised Bella series porcelain panels – that improve the aesthetic appeal of all types of kitchens and bathrooms, as well as splashbacks, fireplaces, staircases, walls, floors, alfresco areas, bar tops and furniture. The family-owned and -operated business opened its doors in 1995 and has spent the last 20 years developing the Bravvo Pty Ltd brand, which is synonymous with quality and durability. The company completes 3–4 installations per day for new builds and renovation projects that range from small to intricate, and is well-equipped to assist with interior design work and material selections.